Readers share BYU stories that still make them smile. NOTE: The following is adapted from a letter written by the author, a former professor of communications at BYU, before he passed away in 2005. In 1963, my first year at BYU, I lived in the dorms with five basketball players—Craig M. Raymond (’67), John R. Fairchild (’65), Jon C. Stanley (B ’66), Neil Roberts (B ’68), and Gary R. Hill (B ’67), all between 6’5″ and 6’11”. One night we went cruising in Provo. As we passed an ice cream shop, some local yokels yelled something at us and displayed on offensive gesture. We decided to have some fun with these guys. We drove around the corner and got out of the car. 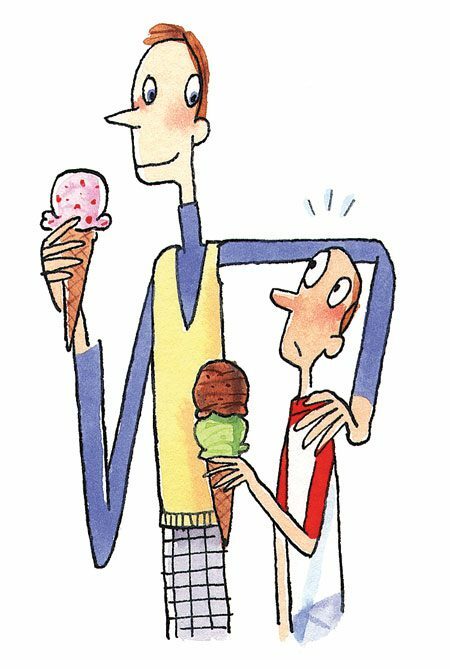 At 6’4″, I was the smallest of the group, so I was sent around the corner to the ice cream shop first, followed in sequential order (from smallest to largest) by the other five. At that point, the yokels found themselves looking at six very big guys. Gary Hill then asked the guys, “Did you want something from us?” After a long pause, one of them said, “We wanted to buy you an ice cream cone.” So we let them. In the mid-1980s, I worked in the basement of the Maeser Building part-time as an aide to the dean of the honors program. Among other assignments, I was occasionally asked to run errands for the dean. One day it fell to me to take—immediately—an important parcel to the executive offices in the university’s administration building. I grabbed my coat and set out—only to run into yellow “DO NOT CROSS” construction tape surrounding the exit nearest to my office. Construction workers were refinishing cement in that area. The man completely ignored me and continued on with his talking. I stood there a minute, not sure what to do. I opened the door until it touched his back. “Excuse me, please!” I said. I assumed he would move aside, but I was wrong. He did not move one inch, did not skip a beat in his conversation. Now I was irritated. He’d had two more-than-polite chances, and that was it. I shoved open the door, smacking it hard into his back, and yelled, “Move it!” He stumbled a step forward and abruptly ended whatever chatting he had been doing. Then he turned around; it was Jeffrey R. Holland, president of the university. As I stammered out a pathetic explanation and apology, he nodded sympathetically, leading me out of the building. Once I had cleared the door’s threshold and was outside, I saw a frustrated camera crew. President Holland had been in the middle of filming a public service announcement about BYU, and I had rather decisively ruined that take of the shoot. By H. David Boucher (BS ’60), Sacramento, Calif. The student sized up the sleeper and said, “Sir, you put him to sleep, you wake him up.” The class—including Dr. Moffitt—laughed, and the man awoke. Dr. Moffitt suggested that the student get more sleep and that this class was not the place to start. The student apologized, and class went on. I felt the teacher handled the situation well, and everyone left having enjoyed class that day. It was 1965 Homecoming Week and my freshman year. I felt lucky to have a new red dress my mother had made to fit me perfectly. Long-sleeved, with a tight waist, it had been waiting in my closet for a fall day cool enough to wear it. I put it on, accessorized it perfectly with red shoes, red earrings, a red bow, and red tights. I even added a red notebook and a red pencil, then set out from Heritage Halls to my first class at the McKay Building. So intent on making a good impression, I had not even considered that BYU (blue and white) that very weekend would be playing the University of Utah, whose color was red. 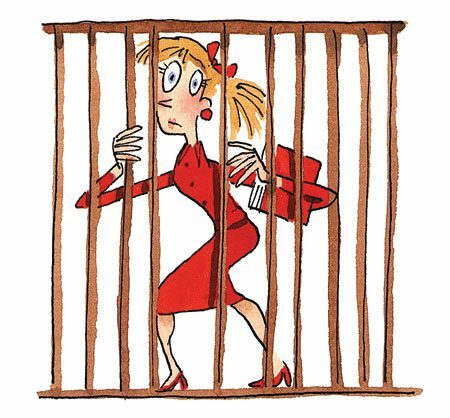 As I confidently crossed the quad, I heard male voices yell, “Get her!” and two upperclassmen chased me down and dragged me into a large wooden cage for all to see. I looked around and saw a few others who also had forgotten and worn some red, but nobody else was as red as me—and that included my face! By Marci von Savoye Williams (BA ’99), Ridgeland, Miss. When my husband, then boyfriend, showed up to his brother’s wedding, his entire family kept pestering him about the big, ugly gash at the end of his nose. But the story behind his nose was not something he was ready to share. The day before the wedding we were on one of our first dates. It was Christmastime, and above each elevator door at S Hall in Deseret Towers hung mistletoe. When our date was over, he walked me to the elevator of my dorm. Standing in the elevator, I pointed up at the mistletoe and smiled coyly, but he didn’t take my bait. Not one to give up easily, I leaned through the doorway and planted a kiss right on his lips. Perhaps he was surprised by my forwardness, or maybe he was just hanging on to the moment; either way, he lingered a bit too long, and the doors closed right on his nose. He had to place a hand on each door to push his nose free. Fortunately, subsequent kisses were not so hazardous, though I don’t think we’ve kissed under mistletoe since.